The globalisation strategy of the companies owned by INVL Technology is based on the export and economic development priorities of the countries of Northern Europe. Companies directly controlled by INVL Technology operate and develop activities in their home markets in Northern and Eastern Europe and implement projects in the countries of Sub-Saharan Africa as well as South and Southeast Asia. Subsidiaries are also being established in these rapidly developing markets, where demand for IT services is growing faster than global demand. These units help INVL Technology’s companies to implement projects and they actively develop direct operations in Sub-Saharan Africa and South and Southeast Asia. Since 1995, INVL Technology’s businesses have completed projects in more than 50 countries of world. Projects conducted in 2017 involved 17 countries. The group’s companies provide services to a variety of public and private sector institutions, banks, law enforcement agencies and other organisations. 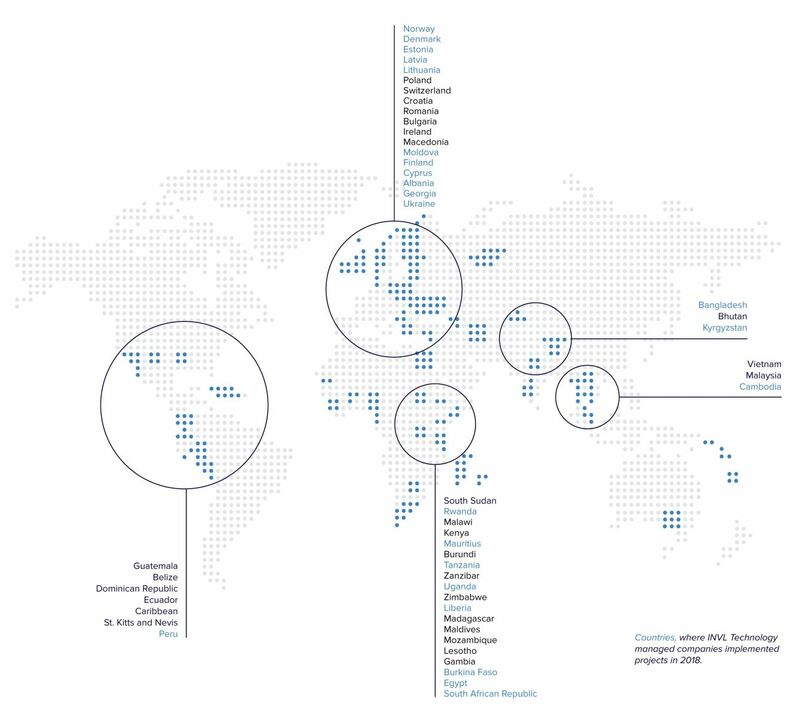 Focused on global business expansion, the group’s companies have developed sales partnerships in South Asia (in Bangladesh, Bhutan and Cambodia), Subsaharan Africa (Tanzania, Burundi, the Kingdom of Lesotho, Uganda, Rwanda, Mauritius), and in Europe (Estonia, Norway, Denmark, Latvia, Moldova and elsewhere). INVL Technology businesses have permanent offices in: Lithuania, Latvia, Estonia, Norway, Moldova, Tanzania, Rwanda and Bangladesh. INVL Technology businesses have established project offices in: Bangladesh, Mauritius, Liberia, Uganda, Mozambique and Zanzibar (Tanzania).